Mount Olive provides many opportunities for growth as we learn together about God’s story in Scriptures, our world today, and where our stories are woven into God’s story as we live as the community of Jesus. Classrooms for children and youth are staffed with at least two adults to ensure safety and an environment where all are loved and valued. The programs outlined below help open us to God’s incredible world, amazing love, and ever-present grace. their Bible, participate in fun activities, and grow in faith. The Preschool classes, along with the Nursery and Little Leapers will be using Spark’s frolic. Using the frolic Bible’s and poster sets, the preschool classes will explore common Bible stories. PK1 will start with the Hebrew Bible (Old Testament) and PK2 will start with the New Testament. 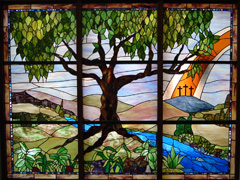 Sunday School classes meet between the Sunday morning worship services at 9:15 am. in addition to the Spark curriculum, will have experiential learning to deepen their understanding of worship throughout the year. Areas of worship that will be explored will include, but are not limited to, making communion bread, acolyte training, reading scripture, ushering, and singing. In addition to class time, where children learn about God’s word through the Bible, all Sunday School ages will participate in music each week. and work for justice and peace. This is a tall order! And it doesn’t just happen overnight. These promises are fulfilled throughout childhood (and beyond). We seek to fulfill these promises together as a community, as we continue to figure out what it means for us to live as God’s people. 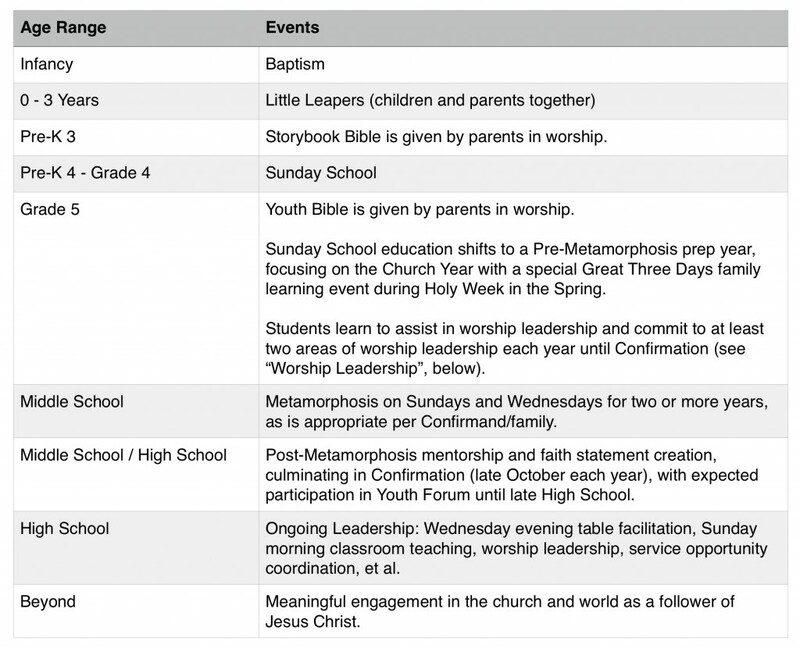 See the table, below, that describes the flow from baptism through adolescence and into adulthood. There is always some flexibility in the movement from year to year, but we hope that this outline will help you as a family identify places to engage as you grow together. The best way to learn about the Sacraments is to participate in them. We call this mystagogy: teaching through participation in the mystery of God’s presence in, with, and under the Word, the Water, the Bread and the Wine. We have ongoing opportunities for you to learn about what it means to be invited into Baptism and Communion. Preparation for baptism begins with a conversation with a pastor. Please contact the Church Office at 507.288.1580 to schedule a thirty minute meeting with Pastor Glenn to learn, share, and prepare for this important congregational event. People of all ages (including small children!) are welcome to join the whole church at the Communion table. An intergenerational session called Welcome to Communion: An Introduction to the Sacrament is available twice a year for those who want to learn more about the sacrament. Both young and old are welcome.